The above image shows Skylab 460 km above the Earth, with the Texas coast and the Gulf of Mexico in the background. Skylab was America's first experimental space station, launched in May 1973 and crewed by astronaut teams three times from May 1973 to February 1974. Visible are the solar telescope with its four solar arrays at the top; the cylindrical living/working area at the bottom (a converted Saturn V third stage) with one solar array on the right; and the two yellow sunshields/sunshades deployed on the first and third manned missions to Skylab. This view represents its configuration and orientation in fall 1974, after the last manned mission. 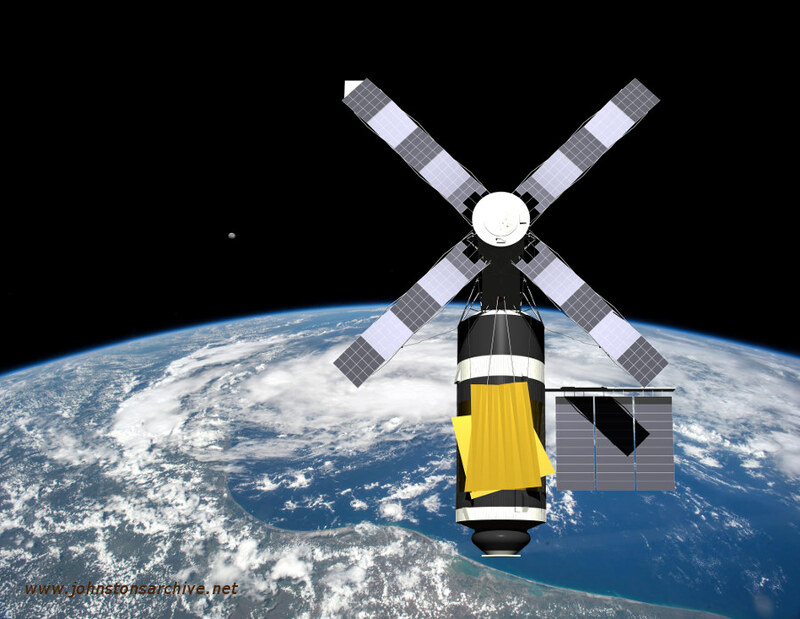 The Skylab model was built from NASA images and documents. The Earth image is a NASA image taken by astronaut Scott Kelly on 15 June 2015 from the International Space Station (link). The above image of Skylab faces the docking port, next to the U.S. flag. The Moon is visible in the background. 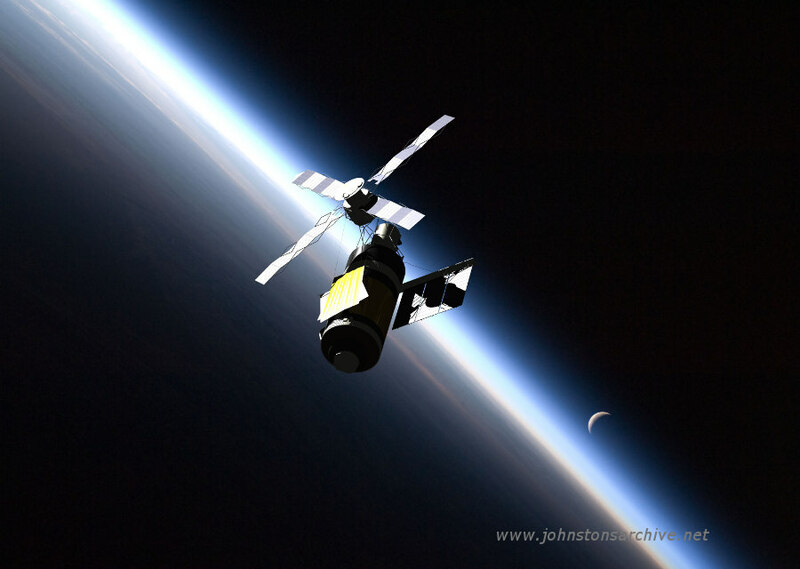 This uses the same Skylab model as above. The above image of Skylab shows the station against the sunset limb of the Earth with the Moon also visible. Skylab's orientation here is tumbling, as in early 1978 before ground controllers regained orientation control which was used to control its reentry in July 1979. 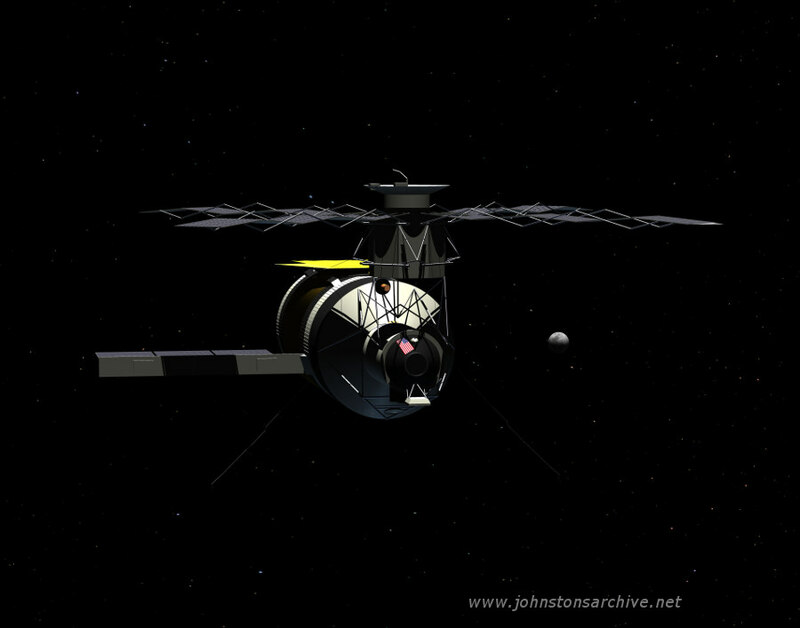 This uses the same Skylab model as above. The Earth image is a NASA image taken on 4 September 2010 from the International Space Station (link). Last modified 15 August 2015.